At the Public Meeting held in Petersham Village Hall on Tuesday 29th May representatives of the National Trust, Richmond Council, Councillor Sir David Williams, and Graham Ball (chair of The Petersham Environment Trust) met to answer questions relating to the electric fence but no agreement with the National Trust was reached, writes Sylvia Peile. The Back Story: You will recall that the Petersham Trust, having restored the meadows and farm buildings, replaced fences and built a new barn, handed over the management of Petersham Meadows to the National Trust with a large endowment in 2010. Residents of Ham and Petersham gave generously to the endowment and attended fund raising events to reach this fantastic target. 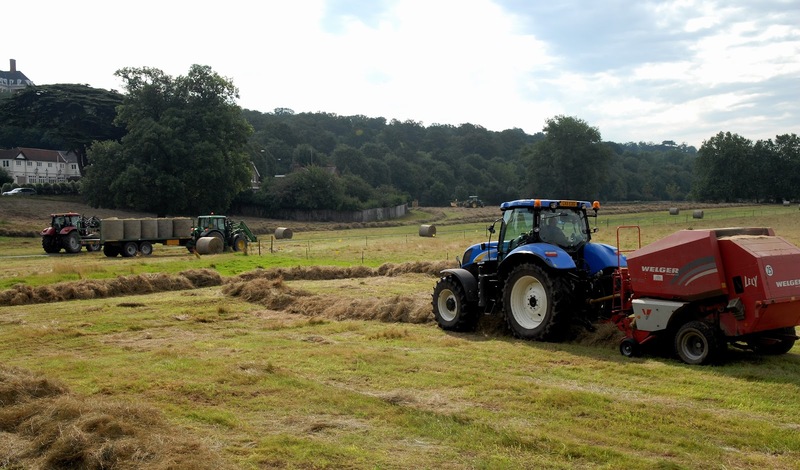 It was the intention of the late Chris Brasher, who started the Petersham Trust, to protect the meadows for future generations , by placing the meadows in the care of the National Trust, ensuring public access and permit cows to graze freely for the majority of the year. In 2011 a dog attacked some of the cows. This was a most unfortunate accident and for some time afterwards the cows were understandably edgy. The National Trust had originally considered removing the cows but were persuaded by local people not to do so. However, since then the National Trust have insisted that the cows must be separated from the public by an electric fence. Their interpretation of their own Health and Safety Guidelines do not permit free grazing. There is no history of cows chasing people, and then only very rarely by dogs when harassed. The Council, as freeholder, have made it clear that they would like to see free grazing returned. There have been two public meetings where residents wanted, overwhelmingly, a free grazing regime restored. It was therefore considered sensible to ban dogs from the meadows and this is having some success but there is conflicting information to owners who can walk along the public footpath with dogs on a lead to cross the meadow but are otherwise banned from the meadow. Because of the electric fence the cattle are unable to use all the meadows so there is less grazing and there is no suitable shelter. The result is they spend more time in the barn. The herdsman has more work keeping the barn clean and there is additional expense with the cost of straw. Our Councillors are working to arrange a meeting with Richmond Council (the freeholder of the meadows), Hugh Brasher to represent that substantial Brasher family interest, and Graham Ball (Chair of the Petersham Environment Trust), who will in turn meet with the National Trust. It is essential to find a solution to this gridlock and to keep cattle grazing on the meadows without a fence. It is not people with cows that is the issue but people with their dogs. This tragedy further underlines the danger of mixing dogs with livestock. Both the lady in Wiltshire and the man injured last week in Shropshire had entered a field of cows with their dogs. Farmers and dog organisation strongly advise dog owners to avoid walking across land with livestock. With regard to the article in the Petersham & Ham Magazine, I am not the author. Cows have grazed Petersham Meadows at least since the early 17th Century. At that time they were part of the estate of Ham House. Today, during the summer months visitors to the area can still experience this pastoral landscape, preserved for the nation through Act of Parliament.